Do you remember the fairy tale “Jack and the Beanstalk”? It was running in the back of my brain as we planted our Super Vegetables. I don’t think our grafted tomatoes and peppers will grow sky-high, but I hope they live up to their billing: taller, double yield, and produce earlier. Grafting is an old craft with fruit trees, as horticulturalists try to breed stronger trees that are resistant to diseases and pests. Same with fussy grape vines. So why not vegetables? You “graft” the top part of one plant onto a stronger rootstock resistant to the scourge of pests and disease. CRR wrote about it for USA Today, and we decided to try a couple plants. It’s a pricy experiment. These plants cost double what we’d normally pay at the farmer’s market. But in the interest of science – and yields! – we forged ahead. 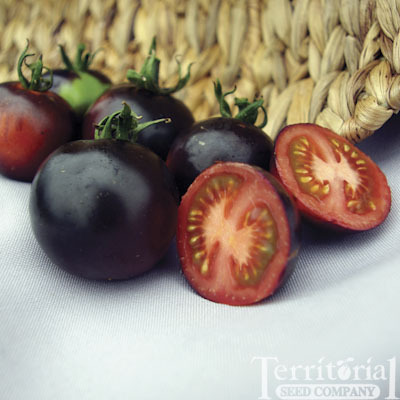 We ordered our grafted plants from Territorial Seed Company in Oregon, but many other companies now carry some of the Super Veggies, to test the market. There’s an Indigo Rose tomato, with purplish skin and red flesh, developed at Oregon State University. A Brandywine, whose heritage is traced to the Shenandoah Valley, promises fruit that is seven inches across! And finally the Legend, a glossy red tomato. We have a couple pepper plants too. The specter of a super-duper Early Jalapeno is a tad intimidating. But I’m looking forward to a bounty of California Wonder, a bell pepper. We’ll plant some “normal” peppers and tomatoes alongside the grafted plants and track their progress. Watch this space for an update.